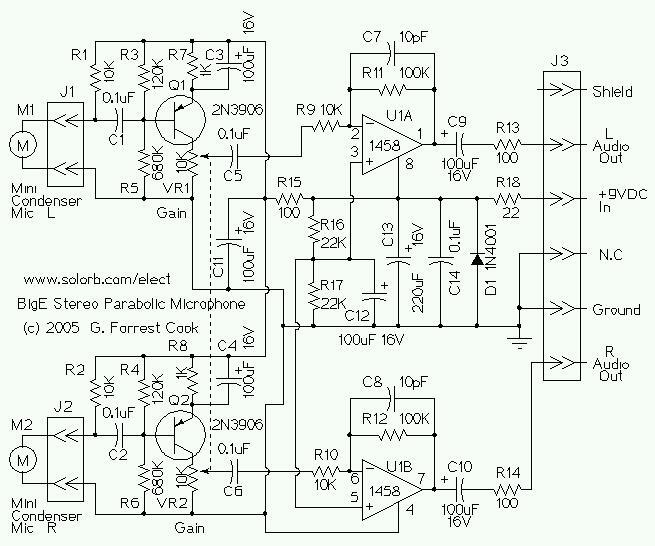 This device is a stereo amplifier for a high sensitivity stereo parabolic microphone. It can be used for listening to distant sounds. Typical parabolic microphones are monophonic, this unit has a stereo audio path that helps produce more realistic sounding audio. The Big-E can be used with headphones or as an audio source for a stereo tape recorder or a PC sound card. This circuit also works nicely as a remote stereo audio receiver for accompanying a video surveillance system. It is capable of operating on the end of a four wire shielded cable that is more than 100 feet long. For remote operation, a set of inexpensive amplified PC speakers can be connected to the outputs for monitoring the sound. The circuit consists of two identical audio channels and some basic power supply filtering components. Only the left channel will be described. The mini condenser microphone converts sounds into an electrical signal. Resistor R1 provides bias for the condensor microphone's internal amplifier transistor. The 2N3906 PNP transistor acts as a low noise microphone input amplifier. The 10K gain potentiometer is used for adjusting the audio signal level. A stereo 10K audio taper pot can be used for adjusting both channels simultaneously, or individual 10K trimmers can be used for fixed gain applications. The preamp output signal is fed into the 1458 op-amp, which boosts the audio to a level that is sufficient for driving an 8-ohm headphone or a tape recorder input. The 1458 amplifier stage is fixed gain (10X) in the inverting configuration, it drives the headphone speakers. Capacitor C9 provides DC isolation from the 1458 op-amp output, which sits at half of the supply voltage. Resistor R13 provides impedance protection for the op-amp output and reduces audio distortion when driving low impedance headphones. DC bias for the 1458 op-amps is set at half of the supply voltage by the R16/R17 voltage divider. Capacitors C13 and C14 filter the DC power supply for the op-amp stage. The DC is further filtered for the input preamp transistors through resistor R15 and capacitor C11. Diode D1 and resistor R18 protect the circuit from reverse battery polarity. The Big-E circuit can be assembled on a circuit board, or hand wired. The board should be installed in a metal box for shielding from unwanted hum. For surveillance applications, the condenser microphones can be mounted directly on the PC board or on the edge of the metal box. The volume control can be mounted on the edge of the box, two 3.5MM mono jacks were used for the microphone inputs, a 3.5MM stereo jack was used for the headphone output. The 9V battery was mounted inside of the box, power is switched via a switch on the 10K stereo potentiometer. 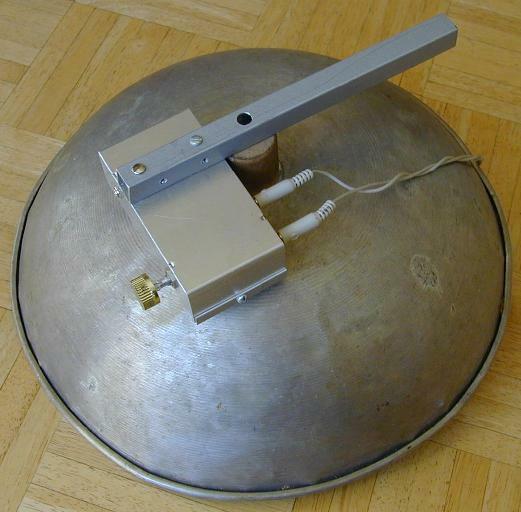 The parabolic microphone assembly was made from an old Chinese wok cooker lid. The microphones are mounted on a metal standoff that places them at the focal point of the parabolic reflector. Pre-formed computer microphones were used for the model shown. The optimal microphone position can be found by pointing the reflector at a distant audio source, then moving the microphones for the loudest sound. The circuit box was mounted on the back side of the wok lid, it was attached to a piec of 1/2" square aluminum tubing, which forms a handle. Start with the volume turned down, point the Big-E at a remote sound source, then gradually turn the volume up until the sound is heard. 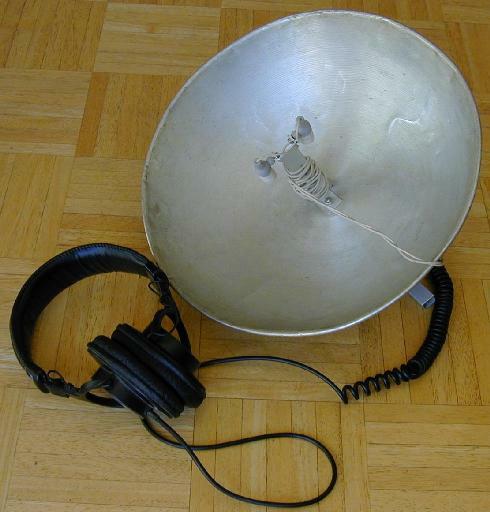 Be careful not to hit the side of the parabolic dish when listening, loud sounds can result. Also, beware that a malicious friend can cause you pain in the ears by talking loudly at the parabolic mic. It is advisable to wear the headphones partially off of your ears while you get used to the operation of the device. The Big-E is great for listening to birds and distant thunderstorms. It is also possible to hear the rustling of leaves on the top of a distant tree during a breezy day. Close-in wind noise may overpower distant sounds.